All are natural stones, there is no two exactly same planet, each is unique solitary. Using the highest fit 8 kinds of gems what it can currently be found, really reproduce every planet in the solar system. Reference to NASA satellite images, to ensure that each sphere has the best ratio and each set plante can be presented to you with high standard. High-end handmade black walnut stand,can be easily placed on your computer desk. This is a unique and creative gift for Christmas/Birthday/Holiday, give you a beautiful starry sky feeling. From August 24, 2006, scientists have newly defined the eight planets of the solar system: Mercury, Venus, Earth, Mars, Jupiter, Saturn, Uranus and Neptune. 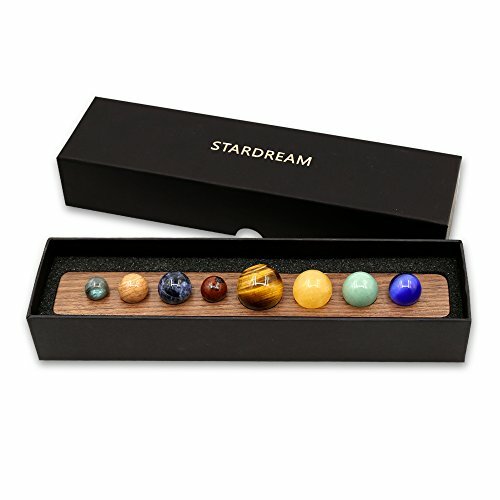 Each gemstone are carefully selected, handcrafted outthis truly unique 8 planets.All natural gems are unique,which selected from the world's gems. Natural gems have flaws and cracks, which are naturally formed and cannot be avoided. Give your family and friends a great gift on Christmas, Birthday, Thanksgiving and other holidays. Black box size: 260x60x40mm, Limited 500 sets. View More In Indoor Fountains & Accessories. If you have any questions about this product by TongYue, contact us by completing and submitting the form below. If you are looking for a specif part number, please include it with your message.